As a pro wrestler, powerlifter and heavyweight MMA champion, Paul Lazenby pulls no punches on the motion capture volume. From his character portrayals in Gears of War to stunt work for Deadpool 2, Paul has become one of the most prominent performers at Animatrik Film Design – the largest independent motion capture facility in North America. This strongman has a wealth of stories to share. 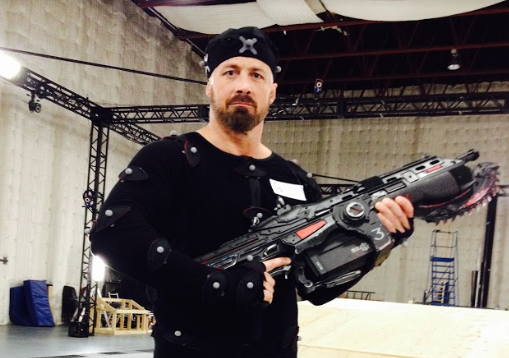 Read on to learn more about Paul’s film career, fighting skills and mocap secrets. ProductionHUB: Can you tell us a little bit more about your background? Paul Lazenby: You could say that the beginning of my career was in 1988 when I spent six months training as an infantry soldier with the Canadian Armed Forces on military bases in Nova Scotia and Ontario. After my discharge from the military, I got into strength sports, achieving third in the country as a strongman, second in the country in powerlifting, and briefly holding a Canadian record in the deadlift. In 1991, I went to the legendary Hart Brothers pro wrestling academy and ended up wrestling on tours as far away as Europe and Africa before getting sidetracked into mixed martial arts. My first competitive fight of any type was in the Japan-based Pancrase organization. It was the most prestigious MMA group in the world at the time, above even UFC, and I was the first Canadian ever invited to fight there. The fight took place in Tokyo in front of 10,000 people and pitted me against the number-three ranked fighter in the world. Somehow, I managed not to die, and I was back in Japan less than a month later fighting the world champion and then living and training at the Pancrase dojo for a couple of months. My experiences there, along with those I had in pro wrestling, laid the groundwork for the physicality I'd need to become a motion capture actor and stuntman. In 2000, I moved from Ontario to Vancouver, got into the film and video game industries, and never looked back. ProductionHUB: How did you get involved with the motion capture industry? Paul Lazenby: My good friend Ken Tsia works for Electronic Arts, and in 2002 he told me they were holding auditions for a video game called Marvel Nemesis: Rise of the Imperfects. I landed the job, and that was the beginning of my 10-year run as EA's in-house big guy. Any time they needed a "big galoot" I would get the call! ProductionHUB: What was your first motion capture experience like? Paul Lazenby: I remember the experience very vividly because it was insanely punishing. The technology was relatively primitive at the time, so mocap performers needed to use big, broad movements that required a lot of energy. We would perform over, and over, and over again. Everything from the biggest stunt to the smallest movement had to be shot multiple times. It wasn't uncommon for somebody to ask for 15 takes and then move on to the next shot without giving you any rest! A lot of stunt performers in Vancouver would turn down motion capture jobs because they consumed so much energy and beat you up so badly. It was a huge challenge, but always satisfying to pull off. ProductionHUB: Describe your average day on a modern motion capture volume. Paul Lazenby: When we get into the studio, we'll usually ease into the day – show up early to have breakfast, sit around, BS for a while. Then we'll put our suits on, get onto the volume and go through a rudimentary set of movements called “ROMing in”. I don't really know the nuts and bolts of it. I can barely check my email without getting a nosebleed from the mental exertion, so I'm not exactly a wealth of technical knowledge! We just go through reference movements, warm up a bit, discuss the scenes that we're going to do for the day and get into it. ProductionHUB: How has motion capture changed over the years then? Paul Lazenby: Oh, it's most definitely a lighter workload. Back in the day, a motion capture job was guaranteed to be grueling. I remember shambling out of Electronic Arts feeling like I'd been beaten half to death with a hammer! Nowadays, technology picks up much of the slack, so it's a much less physically taxing. However, we now face a different set of challenges. Back in the day, mocap performers were all "stunties", but today the technology is so refined that the job requires you to really be an actor. It's gotten to the point where often a stunt double will be brought in, just as they would on a TV show or a movie. The emphasis has switched from being 100% about the physicality to being chiefly about the acting. ProductionHUB: What has been your favorite project or role working with Animatrik? Paul Lazenby: My favorite role is absolutely Marcus Fenix from Gears of War. He’s such an iconic character and such a good fit for me. Rob Hayter, the first stunt coordinator to work on the Gears series in Vancouver, told me he watched about 15 seconds of Marcus’ footage and thought of me immediately. I take that as a tremendous compliment! At the same time, I felt an obligation to do as much research as possible. I wanted to respect the Gears community and meet their expectations. In the end, it wasn't much of a challenge slipping into that role as I almost immediately found that it fit like a glove. ProductionHUB: Could you tell us a little bit more about your work as a stunt performer, particularly on Deadpool 2? Paul Lazenby: I've been lucky enough to work on both Deadpool film; as an actor on the first and stunt performer in the second. On both occasions, it was a brief but fun time on set. In the second, I play a biker who gets stabbed in the stomach. Whenever I get to be a part of something with a rabidly-loyal fanbase, whether it's a game series like Gears of War or a hit movie like Deadpool, it almost always ends up being something that I'm especially proud to have on my resumé. ProductionHUB: What do you like best about working at Animatrik? Paul Lazenby: Animatrik is a professional and efficient studio, and they also treat performers extremely well. The team is not just good at their jobs; they also treat us like human beings, not just disposable commodities. It's always a pleasure to work with them. ProductionHUB: What has been your greatest challenge adapting to motion capture compared to live action? Paul Lazenby: In some ways acting for motion capture easier than live action, because you can be a little bit looser with regard to hitting marks. Camera angles aren't nearly as much of an issue, either. But on the other side of the coin, you have to use your imagination a lot more. When I'm working on TV shows and movies, I can reference the set. I use the atmosphere around me to help feed the emotion that I'm trying to convey. Whereas on a mocap stage, it's all in my head. We wear these ridiculous black bodysuits with balls all over them – you have to get past all of that and put yourself into this fictional world that everyone's trying to create. It can be a real challenge. ProductionHUB: Did any stunts, in particular, stand out for you? Paul Lazenby: While it's far from the biggest stunt I've ever done, I'll never forget the time I tore my hamstring shooting Gears of War: Ultimate Edition. I ended up running around the soundstage, kicking people in the chest with jolts of pain shooting up the back of my leg. Not my best day at work! The craziest day of my overall career was probably when I stunt doubled Steve Austin on a movie called The Stranger. I was using an air ram, which is a compressed air-driven catapult that can throw you extremely high and extremely far. It's very, very dangerous. If you make a mistake – like the wrong shift in body weight or not locking your supporting knee properly – you can get seriously hurt. Air rams have dealt stunt performers some extremely nasty injuries over the years. This particular scene involved me getting thrown away from an exploding car that was parked in a suburban driveway. I was to be shot seven feet up and about fifteen feet backward to land on my head on the lawn of the adjacent house. On a previous day, a rehearsal I'd done into high-jump pads had gone badly and I had seriously damaged my neck, nearly breaking it. With that on my mind, I wasn't happy to hear that there couldn’t be any pads for me to land on when we shot the scene because of the way the cameras were set up. I had to land headfirst on the lawn with no way to spot my landing! Thankfully it went off without a hitch, due largely to my buddy Chad Bellamy triggering the apparatus with perfect timing. I can look back at it as a career accolade now, but at the time it was unbelievably stressful. ProductionHUB: What excites you about motion capture today, and where do you think it could possibly go in the future? Paul Lazenby: I have absolutely no idea where it's going. I've been blown away by advances in this technology over the years. During a recentGears of War shoot, the crew showed us a close-up of Marcus in which I could see the pores in his skin and the faded scar tissue on his face. The detail was so unbelievable, I'm just in awe of what the animators are consistently able to do. I find it surreal how technology can capture little facial tics and mannerisms that are unique to each actor. You see them in yourself whenever you look in the mirror or watch video footage, but you don't really notice them until you see your character doing the exact same things. Watching Marcus move with my mannerisms and body language in Gears of War has been unbelievable. More than once after watching the cutscenes, people have turned around to say, "That's definitely you in there." Anything I do can be captured and put into the body of Marcus Fenix. I have no idea where this technology is headed, but I'm very much looking forward to watching it progress, as I've been lucky enough to do for the past 16 years.